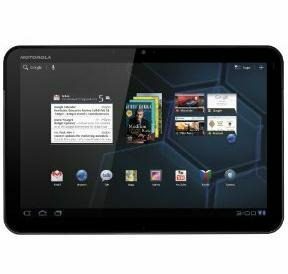 Verizon is finally going to pull the trigger on the Android 4.0 (Ice Cream Sandwich) update for the Motorola XOOM tablet. On Friday, the company announced through its blog that the XOOM will receive an over-the-air update to the latest version of Android beginning Monday, June 4. They did not mention what time the update would begin, but we will keep an eye on it and update this story as information comes in. Verizon said the update will include “speech-to-text technology and the ability to dismiss individual notifications by swiping a finger over an item.” Along with a variety of system upgrades, the update will also include a new photo editor which allows users to crop and rotate photos, correct the redeye effect, and apply effects and level adjustments. Verizon notes that the XOOM is the first Verizon tablet that is being updated to Android 4.0. Without naming any specific dates, Verizon says Android 4.0 updates are also on the way for the following devices: The HTC ThunderBolt, DROID Incredible 2 by HTC, HTC Rhyme, HTC Rezound, DROID BIONIC, DROID RAZR, DROID RAZR MAXX, DROID 4, DROID XYBOARD 8.2, DROID XYBOARD 10.1, Samsung Galaxy Tab 10.1, Samsung Galaxy Tab 7.7, Spectrum by LG, and the Lucid by LG. Android 4.0 was launched in October of last year. Its taken a while for carriers to prepare and skin the new OS for existing devices. But Android 4.0 is slowly gaining steam. A month ago, we reported that Android 4.0 was on 4.9% of Android based devices. Since then, the number has grown to just over 7%, according to Android.com. Let us know when your XOOM starts getting its update! Just use the comment section below.